"Mulkharka pokhri" or "Wish Fulfillment lake" is a natural water reservoir at an altitude of 7300ft, close to the village of Mulkharka. A place bit higher than Darjeeling and sources there confirmed - Mulkharka gets heavy snowfall during the winter. The lake situated on top of a mountain, surrounded by pine trees, bears serenity within. One can spend hours just sitting beside the lake. But the main attraction of that place is the reflection of Mount Kanchenjunga in that holy lake. We were not lucky enough to experience that though. 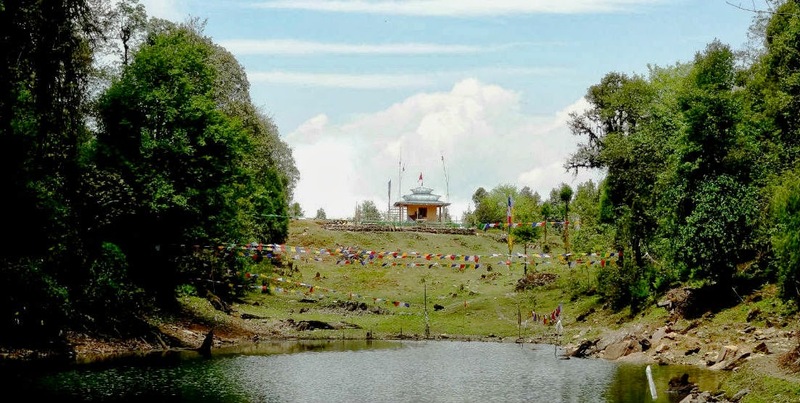 Being the main water source of that area, the lake is sacred to the local Lepcha people. Naturally, there are several legends about the lake. Like, you will never find a leaf over lake water, because there is a bird and it cleans the lake by picking up fallen leaves. There are many more. Explore Lepcha villages nearby. Just go for a trek from one to another and enjoy the natural beauty en route. Accommodations available there are basic home-stays. There you can LIVE their life, if you really want. We were planning it since long time ago, planning for a run away. During all the breaks, that we take everyday between our work, we were discussing on the same topic. The battle that we fought everyday for survival, takes too much from us and my soul was demanding a recharge. Several hours of search effort and it brings us back to a well known track – yet another NORTH BENGAL TOUR! This time a bit different though. A trek route, if you call it a trek, which takes you to the holy lake of Mulkharka and later to some not-so-well-known Lepcha villages. Tickets were confirmed for a journey on 30th April. It was a big team of seven people at that time. Though, only three of us could make it at last. Thanks to the "weekly NJP special" train, which was actually an AC chair car, we rarely had a sleep that night. But to compensate, the train reached NJP station 30 minutes before time. We went to the Siliguri bus stand, taking an auto from outside NJP station. Being in a small group of three, me, Indrada and Debasish, we decided to save some money by travelling in shared vehicles. So we opted for break journeys. First we went to Rangpo, had our lunch there in a South Indian restaurant and again left for Rhenok. When we had reached Rhenok, suddenly it started raining. That did not last for more than ten minutes though. After that it took us a while to find a vehicle for Lingsey – our final ‘motorable’ destination. It was a “Nano”. Baidu and Lalit were waiting there for us. Lalit served as our guide for the next few days and we were really lucky to have Lalit in our team. He is a real gentleman, a true friend, with vast knowledge of woods. His knowledge mostly came from his experiences in that area and partially from Bear Grylls, thanks to Discovery! So from Lingsey it was a team of four. We started our journey visiting the Siva temple of Lingsey, the biggest temple of that area. Considering the construction, I couldn’t say it is an architectural wonder and far behind from being one. The built up is hardly 10-12 years old, the sculptures are work of novice hands. But the temple is very special to the local people. Adjacent to the temple, there is a very unique school "Sanskrit Vidyalaya". From sources we came to know, the Sanskrit school of Linsey contains many old manuscripts in its library. As the school was closed, we were not able to check that collection though. From there, luckily, we had another "NANO" to help us a bit along our journey. It took us to the "Sherpa Monastery" of Linsey. A halt of few minutes there and we left the monastery towards Mulkharka Village. We found many companions in a group of young students, returning from their school. Due to their presence, the walk was never boring. It didn't took us long to reach Mulkharka, and we were there in the village, well before sunset. A homestay was our shelter for that night. It is managed by a young lady - Purna Kumari, we call her "Purna Bahen". Being a remote place, there is no hotel available. If you want to stay at Mulkharka, you will have to stay in Purna Bahen's homestay and that is the only option. To avoid extra expenses, you can contact Purnima directly and trust me that is one of the best home stay I have ever lived in. We had the best food of our journey at Mulkharka Village! Purna bahen was almost always serving us something to eat and everything pure organic. We had "Thumba" - local wine, with Pakora, home-made butter and a superb dinner.We didn't expected it to that cold but at night it was around 12 degree celsius and for me that is comfortable. Me and Debasish, we were sharing a double bed while Indrada was in another room - so that he can't disturb us with his snoring ;-). Another lazy cloudy morning! We wake up late and due to the cloud it was not possible to have a glimpse of Mount Kanchenjunga. So we had our breakfast and then left for the lake Mulkharka. It was an easy 20-30 mins hiking from Mulkharka village. There is a football ground over the hill just beside the lake. The same ground is used to organize local carnival and that left behind signs of civilization in plenty. Lovely place to visit. Thanks for all these pics and info. Thanks for sharing ur experience. A yet -to-be-explored offbit destination in North bengal. I will visit it surely. Thanks for providing essential contact numbers alongwith good narration..